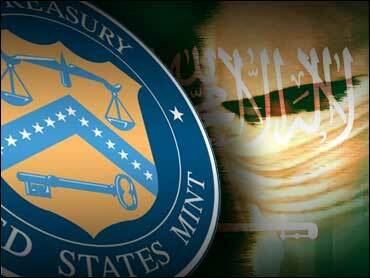 The Treasury Department has moved to block the assets of the U.S. branch of a large Saudi charity that has been accused of diverting money to help bankroll al Qaeda's terrorist activities. The Al-Haramain Islamic Foundation branch affected by Thursday's announcement is listed as having mailing addresses in Ashland, Ore., and Springfield, Mo., according to Treasury's Office of Foreign Assets Control. OFAC said the financial assets and property belonging to the branch "are blocked pending investigation" under the 2001 USA Patriot Act. In a statement, Treasury said federal authorities conducted a search Wednesday of the charity's property in Ashland as part of a "criminal investigation into possible violations of the Internal Revenue Code, the Money Laundering Control Act and the Bank Secrecy Act." "The suspected crimes relate to possible violations of the currency reporting and tax return laws by two officers of the Ashland, Ore., office of Al-Haramain," the statement said. Treasury officials declined to provide further details on the investigation and whether any assets have been found in the United States. Working with the Saudis, the United States has previously moved to freeze the assets of six foreign branches of Al-Haramain. Those branches are in Indonesia, Kenya, Tanzania, Pakistan, Somalia and Bosnia-Herzegovina. The United States has not taken action against the charity's main office in Saudi Arabia. Authorities believe some charitable contributions were siphoned off to support al Qaeda's terrorist activities. Al-Haramain has denied any link to terrorist activities and said it was only involved in charity work for the poor. At its height, Saudi-based Al-Haramain raised $40 million to $50 million a year in charitable contributions worldwide, Adel Al-Jubeir, foreign policy adviser to Saudi Crown Prince Abdullah, said last month.